Thanks to their immense talent, first-round picks in the National Football League Draft, which our very own Philadelphia is hosting today through Saturday, soon will enjoy lucrative contracts, fraternize with adoring fans and compete for Super Bowl championships. Before their respective franchises reward them with those perks, New Era Cap Company will give a nod to their know-how through its 59FIFTY hats, the official on-stage headwear they will don when flashing smiles and exchanging handshakes with commissioner Roger Goodell. 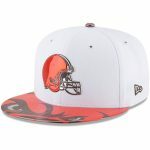 The Buffalo-headquartered entity began hawking the 32 team hats April 17, but it has not dated them by placing 2017 NFL Draft anywhere on the coverings, a move that it hopes will give the goodies a lengthier lifetime. The fortunate fellows who hear their names on the Benjamin Franklin Parkway will likely have many other matters on their minds the instant they become professional athletes, but New Era is hoping they will brim with confidence when wearing the hats. Given its relationship with the NFL, including its 2012 acquisition of full exclusive sideline rights, New Era has always looked to have the nimble newbies look stylish, with novelty being a perennial part of the proceedings. The pieces that his New York-based employer have issued have not escaped critiques over the years, but this current bunch, consisting of liquid chrome on the thread-less-designed logos, three-dimensional textures and faux leather, could prove a hit for fans not just as they partake in the amateurs’ ascension but also as they pass through turnstiles come the start of the season. Since likely number one pick Myles Garrett, a defensive end from Texas A&M University, will not attend the event, which commences at 8:00 p.m. ET, either Jamal Adams, a safety from Louisiana State University, or Solomon Thomas, a defensive end out of Stanford University, will go to the San Francisco 49ers with the second selection, according to an nfl.com mock draft, and thus become the initial performer to serve as a sort-of New Era spokesman. The aforementioned list of predictions surely has fans wondering how particular prospects would look in their respective team’s colors, but no matter who ends up where, New Era hopes the excitement surrounding the hats does not end up capped anytime soon. At the very least, the new hat designs could provide some new ideas for creative cap decoration.